Oh my my. I was just about to shower and decided to stop in the kitchen for a snack, when this combination jumped out at me. No joke–I took a few bites, ran upstairs, got the camera, snapped photos and came right to my desk to tell you about it. Yes, I kind of stink while I type this but only my dog is suffering. Whereas you are getting one of the tastiest, saltiest, sweetest, easiest, healthiest flavor combinations I’ve ever eaten. It also just so happens to work for meat eaters, vegetarians, vegans, dairy eaters, non-dairy eaters, and more! It almost works for raw eaters and paleo eaters, but not quite. Good luck to you folks. You will have to make your own adjustments. But for the rest of you….I have just found a jackpot. Pure gold I tell you. This isn’t exactly a recipe, but more of an idea or flavor combination. And it isn’t complicated, so you may dismiss it as not worthy of your time. 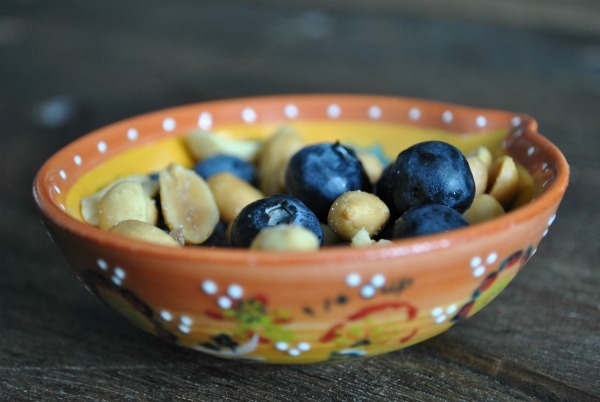 But the next time you go looking for a healthy or even a not-so-healthy snack, look no further than blueberries and salty peanuts. It’s like eating a grown up peanut butter and jelly sandwich, without the wonder white bread and without the work. I’m not saying a PB&J is a lot of work, but you don’t even have to do that much! This baby is delicious. I promise. It is that ideal, crunchy, juicy, salty, sweet snack that you always want on a Friday afternoon–or on a Monday, or a Thursday. If you want a super complicated, completely different but wildly delightful version, check out the PB&J cookie kisses from a few weeks ago. Um…I’m just now realizing my three year old may be affecting my taste sensibilities, but that should not deter you. This is a treat. I promise. Grab handful of blueberries and handful of peanuts. Combine and place directly in your mouth. What are some of your favorite quick combos? Because this one might just change my snack loving life and I would love it if you had some more ideas in your pocket. A quick combo for me is unsalted roasted almonds and dried plain goji berries. Ahhhhhhhmazing flavors when eaten together. I’ve never had dried goji berries. That sounds fun! I’ll pick some up next run at the store. Thanks!